Yesterday’s post included one of my favorite “family” fine dining experiences. So, of course today I have to share my favorite establishment for fast, healthy, affordable eats. I won’t keep you in suspense; it is Chipotle. I am sure you have heard of it and possibly driven by a franchise or two. The restaurant is not new, however, as of last month, Chipotle has added a Kid’s Menu. Not only have they added a Kid’s Menu, but they have added an affordable, fabulous, healthy Kid’s Menu. I’ve been a Chipotle fan since a few girlfriends and I started taking our kids there for lunch after swim class over a year ago. They are always fast, delicious and affordable. The one drawback is finding a parking spot. Yet, the fact that 85% of their beef and 100% of their pork is naturally raised, they don’t use rBGH (growth hormone) in their cheese or sour cream and they attempt to partner with farms that are family owned are all reasons that make the extra effort to find a parking spot well worth it. You can check out their Food With Integrity practices by clicking here. Small Cheese Quesadilla ($2.95) – served with a side of rice or beans. Small Meat & Cheese Quesadilla ($3.50) – served with a side of rice. Single Taco ($3.50) – A single crispy or soft taco filled with taco ingredients. Taco Kit ($3.95) – Kids choose any three ingredients, such as meat, salsa and cheese, and two crispy or two soft taco shells. Kids get to make their own tacos. All of the meals come with a small bag of chips and a choice of organic milk, apple juice or soda. Did I mention you can order online or with the Chipotle iPhone app? Delicious. Chipotle Gurnee Location. 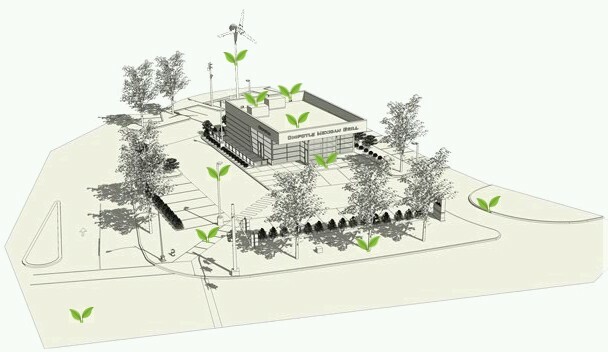 The first restaurant EVER to receive the platinum level design award for Leadership in Energy and Environmental Design. Prior to having kids, I use to love going out to eat. Lately, not so much. Having two children under the age of three has definitely made dining out a little more complicated. My husband and I have been forced to learn which restaurants are kid-friendly and which aren’t so much. I will be honest, for our family, this has been a very slow learning process and I have sat through many meals mortified. Hubs, however, loves his fine dining, especially while traveling and refuses to put off fine-dining until the kids are older. As the saying goes, “I may have lost a battle, but I am winning the war.” We have agreed on three rules that have made all the difference for us while dining out. When making reservations he has to use the specific words, “is your restaurant kid-friendly.” Hubs tried to pull a fast one on me a couple of times by asking “do you accept kids.” Can a restaurant really say “no” to this question? Kid-friendly is completely different. We have to be in and out in an hour. We sit and order for the kids immediately and ask to take care of our check when our meal is brought out. In February, we dined at DB Bistro Moderne in Vancouver and had an amazing dining experience. We of course arrived at 5pm, right in the middle of their staff meeting, but we were greeted with smiles and instantly set up with our drinks and complimentary appetizers by Chef Stephane Istel. The hostess was extremely accommodating and once we were seated, our waitress was friendly, knowledgeable and fast. Chef Stephane, visited our table a couple of times and was so sweet to our children. He went above and beyond to make sure our dining experience was the best and he succeeded. It did help that ultimate foodie, Al Roker, was seated next to us towards the end of our meal. Not to mention, knowing one of the chef’s at Daniel Boulud’s in NYC helps, however, to the DB staff’s credit, they did not learn of that piece of info until our friend called and had champagne delivered to our table. (Thanks Chris!) Regardless, the food was literally to die for. It was so fabulous that we got take-out the following night, which, the chef didn’t recommend, but my husband HAD to have the famous DB Burger. Needless to say, it was worth it. 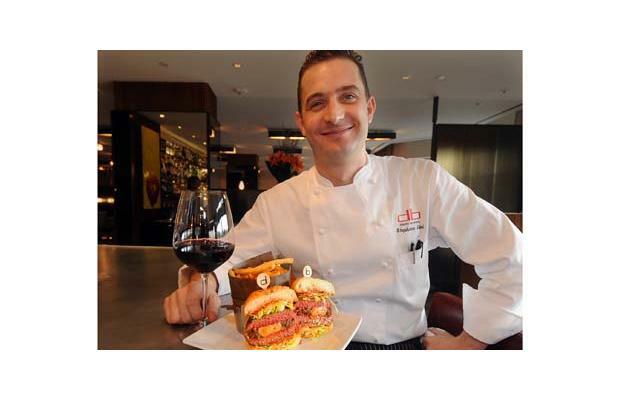 Chef Stephane and the DB Burger. Photography by Steve Bosch, Vancouver Sun.